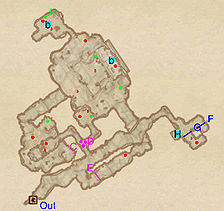 Pothole Caverns is a small cave between the Imperial City and Bravil containing necromancers. It contains only one zone, Pothole Caverns. 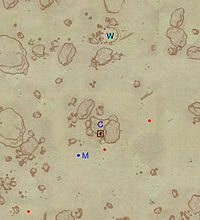 This location's map marker (M on map) is named Pothole Caverns (editor name PotholeCavernsMapMarker). The entrance door is northeast of the marker, 50 feet away. The exterior of this cave offers some clues as to the profession of its inhabitants: just outside the entrance you will find 3 coffins, one open to reveal a Zombie corpse, various tools and bones scattered around. Upon entering Pothole Caverns you will immediately face a triple intersection: the left and right paths provides access to the main chamber of the dungeon, while the path straight ahead leads to a prison area. 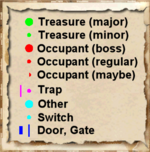 This area is made up of three cells: an unlocked one contains a dead captive (H), a locked one (G) holds up to two enemies while the third one (F), also locked, only contains a bread loaf. Heading left is advisable, as you'll find it easier to return to the entrance; the only draw-back being that you will not be able to use the Falling Log trap at E to your advantage against the enemy nearby. After tackling the Swinging Mace traps at C (make sure to avoid the pressure plates that activate them), check out the small room to the right and then jump down a hole to find up to three enemies and a dangling corpse to greet you. Using sneak is advisable in the large chamber as you may face up to four enemies at the same time. On the northeastern wall is an altar area with two altars, a corpse clamped to the wall and a sacrificial altar (b) that you can sleep on. 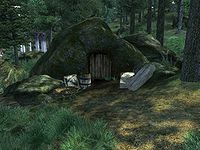 Before heading back out, don't miss the room to the north which contains up to two enemies, a bedroll (b) and a chest (k) which holds the key to the cells.